8/92 David Mumpower This is the Rena Sofer of cinema: it has looks and personality plus. 15/126 Kim Hollis A gorgeous painting sprung to life. And every single picture tells a complicated story. 50/55 Reagen Sulewski Best Cinematography of the year, but I've never been so bored by a film with this many fight scenes. There is an egocentrism native to North American audiences which requires us to believe that our theatrical productions are the only ones in the world with importance to them. Obviously, a society that produces work on the epic scale of Dude, Where's My Car? has cause to feel such superiority, but the recent performances of foreign language films such as Life Is Beautiful, Amélie and (especially) Crouching Tiger, Hidden Dragon have emphatically demonstrated that many of the finest features in the world are not created in the Western Hemisphere. I am not delivering ground-shaking news here when I say that many of the most innovative films in the world have come from the industry that is Hong Kong cinema. That influence snuck upon our shores in surprising fashion, when a director unknown to American audiences helmed a Jean-Claude Van Damme film called Hard Target. Since John Woo's debut on foreign soil, he has gone on to become one of the most respected creators of action sequences we've ever had in Hollywood. The fact that he had been dazzling audiences for the better of two decades already was conveniently ignored by the public. What was not is his impact in films such as Face/Off, Broken Arrow and Mission: Impossible 2. Woo's success combined with the "discovery" of a then-44-year-old stunt man named Jackie Chan in Rush Hour cracked open the door for an influx of new cinematic ideas which Western audiences have since embraced. 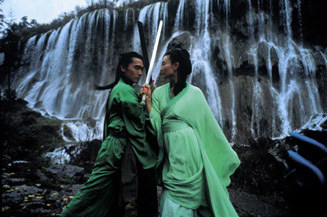 Consider that the afore-mentioned Crouching Tiger, Hidden Dragon is the all-time box-office champion of foreign-language films. Consider that the afore-mentioned Woo film MI2 and Chan's Rush Hour sequel have both grossed over $200 million domestically, on their way to combined worldwide receipts in excess of $850 million. And then there's the kung-fu fight sequences directed by Master Yuen Wo Ping. Combining those with the Woo-esque gunfights helped launch the Matrix phenomenon which started in theaters and ended up carrying North American consumers into the digital video era by driving DVD unit sales for the greater part of two years. We are a new market for Hong Kong cinema, and there is still plenty of room for expansion in the coming years as more product invades the cineplexes. Some will be like Iron Monkey and Zu Warriors, fascinating and gorgeous fight sequences entwined with storylines that mainstream audiences are unfortunately likely to shun. But then there are others, such as Hero. Hero is arguably the most ambitious non-North American production ever. This movie truly has it all. We're talking about a film that stars rising action hero Jet Li, who proved himself to be a draw in 2001 with his performances in Kiss of the Dragon and The One. As dominant a martial artist as he is, the producers of this film realized that his foil must be equally impressive, so they hired Donnie Yen, the very man who made Iron Monkey special. This is nothing short of a masterstroke, and the choreographers of the fight sequences between the two actors sound positively giddy in describing the footage of their combat. If there is no other reason to see Hero, guaranteed rumbles between the Iron Monkey and the Black Mask should do it for you. But Hero has so much more than that. For instance, there's Zhang Ziyi. She was a key portion of both Rush Hour Two and CTHD. As much as anyone else out there, she represents the new face of Asian cinema, and that face is as flawless and pristine as a handful of uncut diamonds. In fact, I have noted previously that there is an interesting dichotomy in the way she has been presented in her Eastern and Western performances. In roles such as The Road Home and Zu Warriors, she is given a gritty, desert look, where her natural beauty is countermanded by earthly challenges which seek to overwhelm her. Basically, she always looks like she needs someone to give her a bath. Any volunteers? The core opposite of this is the way she is shown in Rush Hour Two, as a woman with looks that kill and kicks that are equally damaging. She is a femme fatale in the classic mold, but she is definitely given a much larger dose of elegance in the exchange. Amusingly, her CTHD character, Jen Yu, demonstrates these two looks in a single role. For half of the film, she is the gorgeous, pampered noble. For the rest of it, she is a desert rat. I'll leave you to decide which way is better. Ziyi is joined by In the Mood For Love co-stars Maggie Cheung and Tony Leung, who are apparently attempting to become the Asian version of Brad Pitt and Julia Roberts by working together in every possible project in the last year. Leung is one of the finest actors in the world, and Cheung's In the Mood For Love performance with him earned her a first-place vote as Best Actress of 2001 from one of the judges of BOP's own Calvin Awards. As if these five stars weren't enough reason to be excited about the project, its director seals the deal. Yimou Zhang's track record speaks for itself. Most notable in the US for Raise the Red Lantern, a 1992 nominee for Best Foreign-Language Film, Zhang's directorial efforts have won him audience awards at Sundance and Cannes, in addition to jury prizes for best picture at Cannes, Berlin, and Venice. He has won Best Foreign-Language Film at BAFTA, received the Five Continents Award from the European Films Awards, and been honored as the Freedom of Expression winner from the National Board of Review. Even if you don't know who he is, it's easy to infer that he is a damn good director. Oh, and by the way, he also was the first person to ever cast Zhang Ziyi. Yimou Zhang's proven track record is important, because a lesser director might be overwhelmed by all of the pressures involved with this production. With a $30 million budget and a virtual who's who of A-list Hong Kong actors on board, this film's expectations are through the roof. Also, there will be unavoidable comparisons to Ang Lee's excellence in helming CTHD throughout Hero's run. With Hero, Zhang will be attempting to explore the reality of the archetypal Eastern philosophy hero by analyzing the truths behind the myths. Hero is another variation of the very popular and often re-told story of Ying Zheng, a feudal warlord whose ambition drove him to attempt to conquer the six kingdoms of China. If you are a foreign-film buff and this sounds familiar to you, you're not crazy. Sony Classic's 1999 Cannes Film Festival Technical Grand Prize winner, The Emperor and the Assassin, was also based on this historical legend. There is a difference between the two projects, though, as The Emperor and the Assassin strived for some accuracy, while the events of Hero are completely fictitious. In Zhang's version of the events, three assassins with the exquisite names of Flying Snow (Maggie Cheung), Broken Sword (Tony Leung) and - far and away my favorite - Silver Spear Long Sky (Donnie Yen) are hired. Their assignment is to stop the would-be emperor from completing his goal of ruling all of China. Standing between them in this endeavor is Ying Zheng's protector, Wu Ming (which translates as No Name). This warrior/protector is an enigmatic man of few words who defends his majesty but who also has a hidden agenda which drives him. Zhang Ziyi's character is Like Moon, a maid of Broken Sword's who is also hopelessly in love with him. So who is the hero? Therein lies the intricacy of the story. An argument could be made that any of the main characters is a hero. Everyone wants to kill Ying Zheng, so he might not be Mr. Charisma, but he does have a dream of unifying several warring clans under one sovereign realm in order to bring peace to all. The three assassins are heroes who give up personal gain in order to advance the greater good in which they each believe. Ziyi's character is a hero for standing up and fighting for her true love. Jet Li's character is a hero for reasons that would spoil the film if I told you.